Do you get a bad case of the nerves when you think about going to the Jefferson City dentist? Sedation dentist Dr. Johnson and his caring, friendly team understand that some people simply freeze in terror at the thought of going to the dentist. The goal of sedation dentistry is to ensure you are able to receive the dental care you need in a relaxed atmosphere. 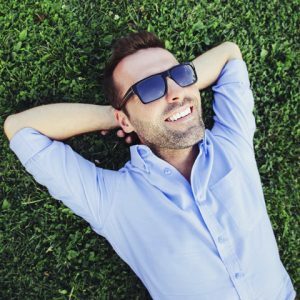 Sedation dentistry with a skilled sedation dentist is a safe and easy alternative that can allow you to have dental procedures in a relaxed state without worry, anxiety or panic. Sedation dentistry options include oral sedation, or laughing gas. Our trained conscious sedation dentist provides sedative medication that slows the action of the central nervous system of the patient. Conscious sedation patients remain aware of their surroundings but are less responsive to the external stimuli in the environment like the sound of a drill or the smell of dental materials. Conscious sedation patients generally feel calmer and more relaxed after receiving the sedative. Sedation dentistry medication is generally mild or moderate with patients staying alert and responsive so they can answer questions. Patients inhale the laughing gas mixture, keeping them completely relaxed. Despite being called called “laughing gas”, it doesn’t make you want to laugh. Laughing gas simply relaxes you so you can feel comfortable during your general dentistry or other dental treatments. Patients can choose to take an oral sedative in pill or liquid form with a little water. Once the medication takes effect, and the patient is feeling comfortable and calm, the sedation dentist can complete the dental treatment. Typically, the pill is taken before you come to our office and the effects take a little while to wear off, so you will need to arrange transportation to and from your appointment. A skilled sedation dentist, practiced in sedation dentistry, helps patients in the Jefferson City area get the dental work they need to regain their confidence and get their smile back. We take the worry and anxiety out of dentist visits. Call today!